Are you a risk taker? Or when it comes to the rules of fashion do you like to play it safe? There are so many fashion rules for men and women out there that it can be hard to know if you’re making a style statement or a style disaster. This blog will take some of the most established fashion rules and show you how to turn them on their head without feeling self-conscious about breaking out of your comfort zone. The fact is, you can wear any colour combination you like – black on black, black and brown, black and tan, even black and navy! The fashion rules have changed, and now more than ever designers are using these colours together on the catwalks. If you want to ease into this trend slowly, try pairing your black jeans with lighter shades of blue and brown for a greater contrast effect. You might shudder at the thought but the fact is mixing a formal look with informal footwear is very on trend, and not to be dismissed. If you are feeling bold and want to try this look, stick to plain coloured trainers with minimalist patterns, and pair with more relaxed suit styles like linen in the summer months. You’ve probably heard the old adage that you should match your belt and shoe colour, but the fact is that these days it’s rarely done, and with so many amazing colours available today it would be hard to see the logic in it. For example, this calf leather brogue belt in rum and mustard is a big hit, as is this blue suede leather belt. Add a bit of frivolity to your style with a splash of unexpected colour to break those strict fashion rules. The rule is, if you wear horizontal stripes they’ll make you look bigger than you are, but this doesn’t seem to stop everyone from wearing them and looking great while doing so, so why shouldn’t you? As we approach the summer months, stripes will be everywhere (as they always are), invoking thoughts of luxury yachts and the French Riviera. Embrace the stripe, you won’t regret it. Spots with stripes? Checks and florals? Whoever would have thought that mixing patterns like these would be such a controversy, and yet it is one of the key fashion rules which the industry encourages you to break. For men, it’s a little more limiting to find ways to try this trend, but our advice is to mix up your shirt and tie combination to great effect. This rule just isn’t the case anymore, and when it comes to showing off your arms the more ways to do it the better! If you spend time sculpting your biceps, the last thing you want is to hide them away so show them off with pride in a tightly fitted short sleeve shirt. 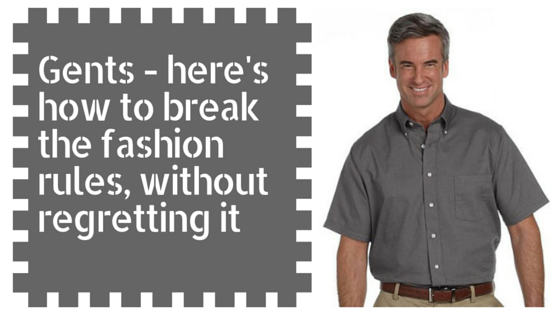 If the arms need a bit more work, stick to a long sleeved shirt with the sleeves rolled up instead.